In 1929, Eula Scott became the youngest pilot in the United States. She was born in 1915 and has soared to great heights throughout her life. Under the tutelage of Wiley Post, Scott learned how to fly. She even worked as a stunt pilot for many years of her life, until ending her career to focus on her children and her family. As Eula focused on her family, she began a second career working for the Chickasaw Nation as one of the tribe’s first community health representatives. In 1983, she was elected and served three terms in the Chickasaw legislature. 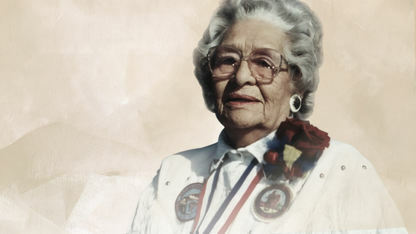 Her life epitomizes equality and independence, two traits that resonate highly in the Chickasaw Nation. She has been featured in several texts, highlighting her skills in aviation both as a woman and as a Chickasaw.